The Ontario Australian Football League in Canada's east has been that country's stronghold of Aussie Rules for the past 17 years. Based on the playing numbers and teams, it appears as though that region has stabilised for now. What is encouraging is the continued work to expand the number of clubs in the fledgling footy provinces of British Columbia and Alberta. In BC, on Canada's Pacific west coast, the Vancouver Cougars were the only club until last year. Then the Victoria Lions came onto the scene, and were very competitive in their first season and so far this year. Based on Vancouver Island, the club is just a ferry ride (albeit a notorious crossing) from Vancouver. In addition, the Vancouver Cougars have been working hard to expand their numbers, with the goal that their intra-club matches ultimately spawn two independent sides. Another small but significant step towards this has occurred this year, with new guernseys for the second team, the Burnaby Eagles. Currently the two sides still unite as the Vancouver Cougars for some matches, but as the Eagles players form their own identity, the final split to have two independent clubs in Vancouver shouldn't be far away. That will bring the number of full teams in BC to three - still well behind Ontario's ten, but a great start given the game's shorter history there. A spin-off from the Cougars has also been the North Delta Junior AFL, a much welcomed junior program for the region. With one of its key founders, Mike McFarlane, now President of AFL Canada, perhaps junior development will receive renewed focus in the next few years. On May 14th, Victoria visited Vancouver and the Cougars and Eagles competed independently. In the first match Vancouver 64 defeated Victoria 17, then Victoria 30 defeated Burnaby 23, before the Eagles struck back, Burnaby 52 defeating Vancouver 35. It is clear that by dividing Vancouver has weakened its side, but has taken an important step in growing the game. 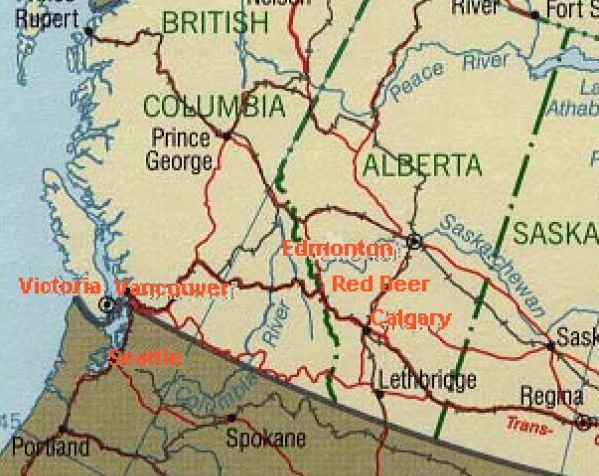 On June 18th they are scheduled to again split into Vancouver and Burnaby, to take on Alberta (combined Calgary and Red Deer) and Seattle. Next we look at Alberta. 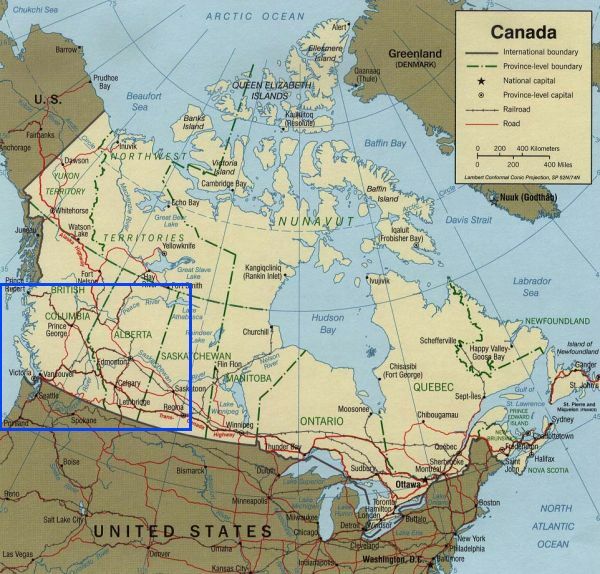 This province is the next one east of BC, and has seen three Australian football clubs in recent years. Currently active are the Calgary Kangaroos and Red Deer Magpies. The two sides play a regular series of matches, with the record so far this year two wins to nil in favour of the Roos. Reports are that Calgary side has very good numbers this year and both teams are looking good. We're also told that Red Deer is primarily made up of Canadian players, another good sign for footy in Alberta. The other footy club was based in Edmonton, but is currenty dormant. Also to watch out for on the Kangaroos website is a piece written by Joshua Symonds, a Canadian who has played for the national Northwind team and has written about how he came to know about and play Aussie Rules. The Vancouver Cougars and Victoria Lions compete in the North West Pacific AFL, against American side the Seattle Grizzlies. Through this relationship it is hoped that a leg of the US Western Regionals will be held at Vancouver's impressive facilities in July. There is also talk of an inter-provincial series in future years. This has only been put up as a suggestion, but would probably be good for promoting the game as the elite level below internationals. Although the non-Ontario provinces would probably struggle in the early years, it may be time to get the concept started, much like New Zealand's National Provincial Championships and the United States' East versus West All Stars weekend.